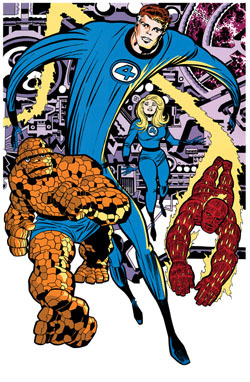 I have just received word from fellow comic artist, Charles Yoakum, that you are bringing out Mr Lee and Mr. Kirby’s FF book. Wow this is like being a kid again and waiting to see the latest issue. I am awaiting word back from his daughter Lisa Kirby, at the moment, for my request to enter her father into my Hall of Fame being created on my website, where given permission he will head the section. Being the reason I became a comic artist and writer myself I hope to see his name in there. Please feel free to take a look when the section goes live. There are some great people going into it, some working still , some sadly no longer with us. I will also plug this wonderful book on my website. I will sort a link to this blog this evening to direct people here. Good Luck with the book…I am sure that it will be as great as all the others I have purchased off you.